We had the opportunity to review a costume from BuyCostumes.com recently and enjoyed the experience. 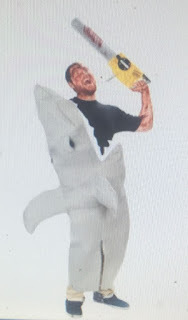 My son is a huge Sharnado fan and wanted to do a costume similar to that and I chose the perfect one for him as you can see below. You can find it here. The company sent the costume overnight express and the shipping company lost the package. Buycostumes.com stayed after the company and after almost 2 weeks decided to send us a brand new costume. They sent it and sent it 2 day air and the shipping company still took a week to deliver it and delivered the original at the same time. I do not blame Buycostumes.com at all because they went above and beyond to ensure we were taken care of. I would just recommend they use someone else as a shipper. The costume was well made and their customer service is excellent. Looking into getting a santa or elf costume from them real soon. I would recommend you do the same. Here is a link to all their Christmas and holiday costumes (here). I especially love their Velvet Santa Costume. I came up with this recipe years and years ago. It is a mix you can store for up to 3 months (or more) and will make 3 full size 9"x13" cakes. The cake is so good that we generally don't even frost it because it is so moist and delicious no other topping is needed. Occasionally we do dust the top of it with powdered sugar but that is more for presentation than anything. I made some up and sold a bunch of these at a bake sale recently. Preheat your oven to 350 degrees. Spray your cake pan with cooking spray and add batter. Bake for 27 minutes. 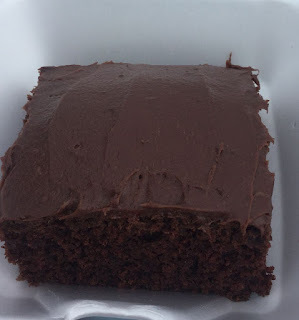 I used this cake recipe in another recipe: My "Death by Chocolate Cake" or my candy recipe for Homemade Reeses!. 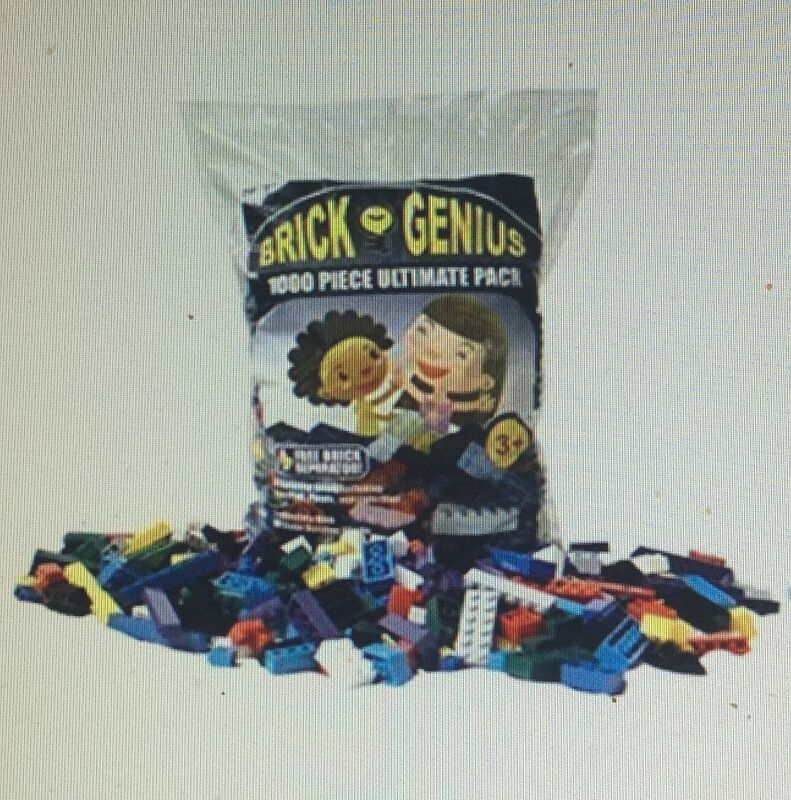 Brick Genius building blocks are so much fun. They are very similar to Lego blocks and are compatible to them. This bag comes with 1000 bricks which is a really nice start for someone just getting into building blocks or will really add to a collection. Our boys have a LOT of legos but were so thrilled to get all of these. There are so many more things they can make now. If you are concerned about whether these will work with other building blocks then the answer is yes. We have duplo and legos and they fit perfectly with both of these. And this bag comes with a brick separator which is really nice. My youngest is autistic and sometimes gets frustrated when he can't get them apart and this saves him aggravation. 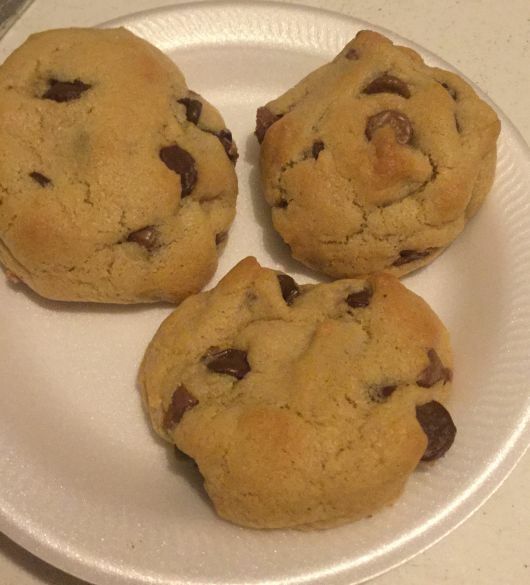 I am forever creating and recreating the best chocolate chip cookies in the world. I will come up with a recipe and everyone we know will love it and I'll be content for a few months and then I'll start to "dibble" with it a bit and improve it even more. 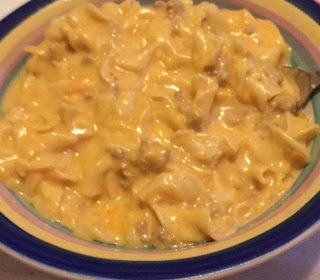 This is what this recipe is except I do not see any way to improve it. I think I have finally achieved the PERFECT chocolate chip cookie (at least for my family and friends). This cookie is the perfect degree of softness and has plenty of chocolate chips in it. Preheat your oven to 375. In a large bowl, beat together the shortening and butter. Mix in the sugars, salt and baking soda until just combined. Now add in the eggs and vanilla and mix well. Stir in all other ingredients except for the chocolate chips. 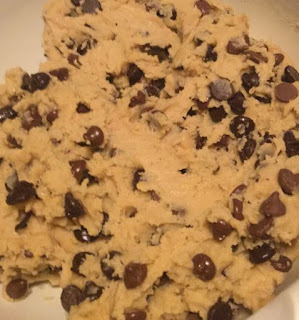 Once the dough is mixed well, fold in the chocolate chips. You can use just one bag of chocolate chips but mixing the two kinds of chips really does make a huge difference on the taste. 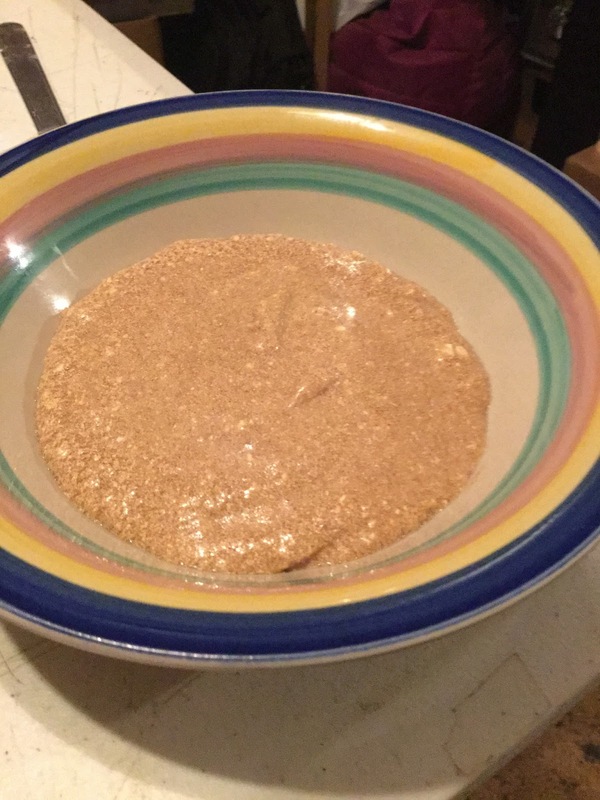 This is the consistency of the dough after you mix it. 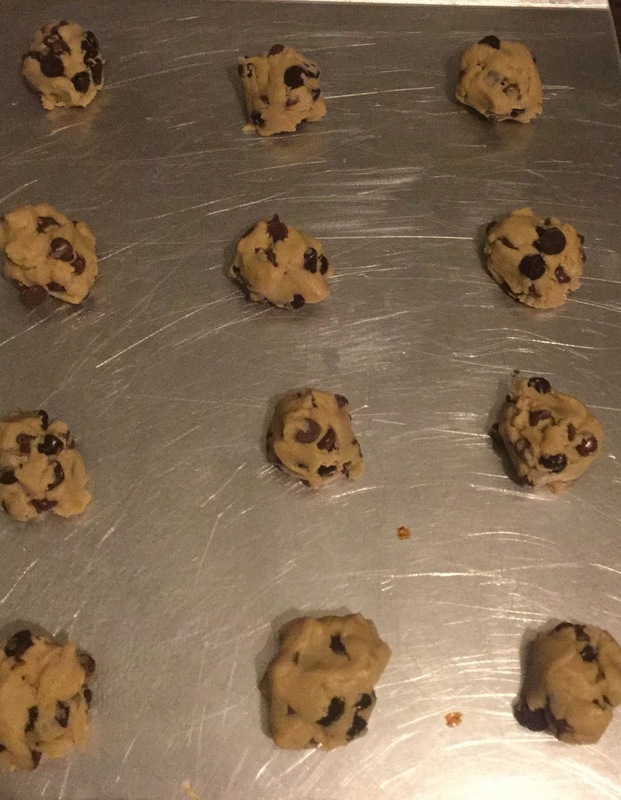 Spray your cookie sheet(s) with cooking spray and then drop the dough by spoonfuls onto the pan. Bake for 8 1/2 minutes. 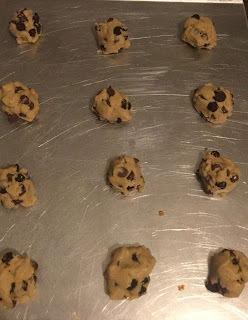 Allow the cookies to cool for 2-3 minutes before removing from the pan. The cookies may look pale and underdone when you remove them but will finish cooking the last little bit needed on the pan. Other recipes of mine that call for chocolate chips are: Pumpkin Chocolate Chip Coffee Cake & Chocolate Chip Cookie Bars. Check them out! I love mixing up different flavors of butter. I am always trying out other people's recipes or simply creating my own. 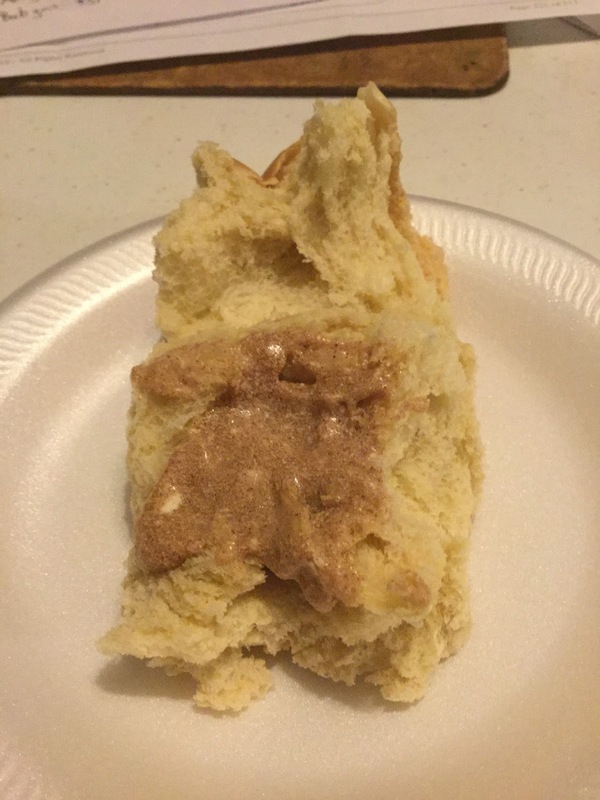 One favorite at our household is my Sweet Cinnamon Butter. Stir all ingredients together well and serve over rolls, toast, or bread. 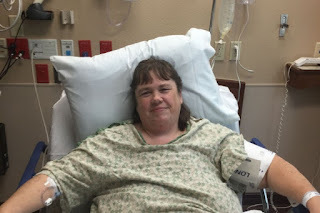 I am sure many of you have noticed that I have not been blogging much; the reason is that I have been going through a lot of medical issues over the past few months. Since early May, I have been seeing various specialist and having all sorts of tests run. My heart is very weak from years of untreated high blood pressure. For a long time we did not have health insurance and I am paying the price for that now. We have insurance now (thank God) but I still have co-payments and am traveling to McAlester (1 hour away) and to OKC (3 hours away) and to Ft. Smith (1 1/2 hours away) frequently for various tests and procedures and to visit the specialists. The expenses are really putting a tremendous burden on our family. A sweet friend has started a Gofundme page for us. If you can contribute even $1.00 it would be a help to us because if everyone that could donate gave just $1.00 it could really add up and help our family. I hate asking but I'll do anything (even swallow my pride) for my family. Here is the link: Gofund me for our family. I had a visit with my cardiologist today and after wearing another heart monitor (this time for 2 weeks) he has me on new meds and are weighing other options. I am currently taking 28 pills a day and 5 shots; primarily for my diabetes. I also have diverticulitis and am awaiting to have my gallbladder removed and a total knee replacement. Anyway, thank you for being here for me. If you can not give financially, can you share the gofund me link and pray for me? Thank you so much. You can also read about my life with MS.
Start out by browning the meat. 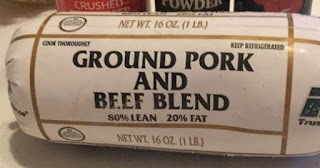 We used to make this with ground beef (hamburger meat) but since the price of beef has skyrocketed we now use ground pork and beef. Ground beef is about $4.50 a pound but we have found ground pork and beef for just $1.67 a pound at our local IGA store. Once it is browned, drain and set the cooked meat aside. In a large pot, add in your water, milk and your spices and stir well. Dump in your egg noodles; stir and then add the cooked meat into the pot. Bring to a boil over medium-high heat. Stir a few times as it cooks. Once it boils; turn the stove way down; cover the pot and simmer 8 minutes; stirring occasionally. 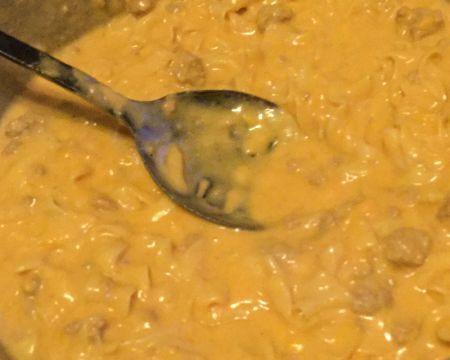 Remove the pot from the stove and stir in the cheese and it is ready to serve. We like to enjoy ours with homemade bread. This makes a large pot of food. If you are not big eaters or don't like left overs, cut the recipe in half. We are a family of 4 (3 of them are male) and we have 2 bowls left over for a meal the next day. End your meal with some Brownies! Yum, yum, yum! We recently had the opportunity to review the Double Camping Hammock from Live Infinitely. The hammock is very strong and durable. There are two colors to choose from either the purple with grey trim or the dark grey (more like black) with blue trim. We chose the one with the blue trim. The hammock is made from weather resistant parachute material and the seams are triple stitched so it won't be coming a part any time soon. It is guaranteed to hold up to 450 pounds so it definitely truly is a hammock built to hold two people. The feature that I was most impressed by is that it has an anti-flip design so you can feel safe getting in and out of it. 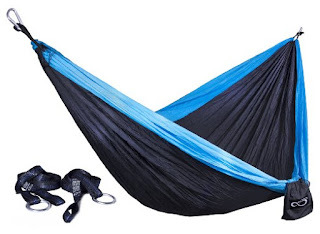 And unlike most hammocks that I have seen, this one comes with a really nice set of hammock straps. These are heavy duty, stainless steel and nautical grade nylon rope so I feel comfortable using these straps instead of buying another set. This would make a great addition to a bug-out-bag because it fold neatly up into a small pouch that measures just 6"x8" and weighs less than 2 pounds. We plan on keeping it in our BOB but plan on using it for our many camping trips too. We really are pleased with it and think you will be also. We recently had the unique opportunity to review a great set of earbuds: the Audiosharp AS1130 Noise Isolating earbuds. These are amazing!!!! These are constructed of solid metal. They fit very comfortably into the ears and come with a nice, rugged case for storage. Unlike most earbuds on the market, this one comes with several different sizes of ear pieces so you can get the best, most comfortable fit. These earbuds are unlike most you have ever tried. They are AMAZING. I can't believe the sound quality. 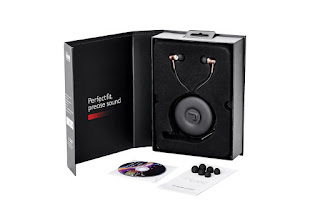 Very natural sounding and you get a high intensity listening experience. Very clear sound and a deep powerful bass. ♦ In-ear style wired earbuds with multiple sized ear plugs for a customized fit. Comes with 3 extra pairs of ear plugs. ♦ Small and light weight design with a good length cord and metal construction. 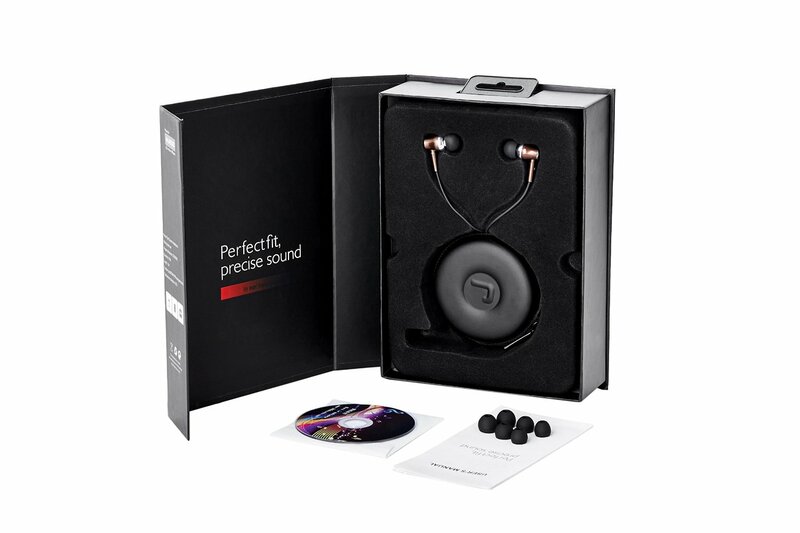 ♦ Great sound quality for a wide range of music styles with some great mids and highs and impressive, deep bass. ♦ Gets very loud while maintaining clear sound at all volumes. ♦ Frequency and bass response was amazing with an audible range of about 25Hz to 15000Hz. ♦ Headphone plug is thin and fit my Incipio DualPro Case with plenty of room to spare. ♦ Comes with a round zipper case for storage and travel. The inside of the case has a little net one one side to hold small items. ♦ Also comes with some kind of CD and the instruction manual says something about headphone burn-in, but the manual is mostly gibberish. It looks like it was run through a translator with no editing afterwards. None of it seemed necessary.